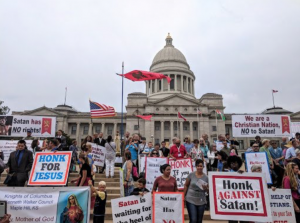 An image made in the likeness of the dark lord himself, aka, Lucifer: The Fallen, The Morning Star, The Great Deceiver, Old Nick, Mayor of Hell, Apollyon, briefly appeared outside the Capitol building in Little Rock, Arkansas, yesterday, and it was magnificent. 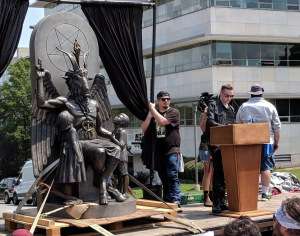 The “Satan Went Down to Arkansas” rally, held by the Temple of Satan (bless them), showcased a giant statue of Baphomet – a deity linked to the Knights Templar in the early 14th Century – which they hope to install permanently to live side by side with a controversial statue of the Ten Commandments that currently adorns the grounds of the state Capitol. 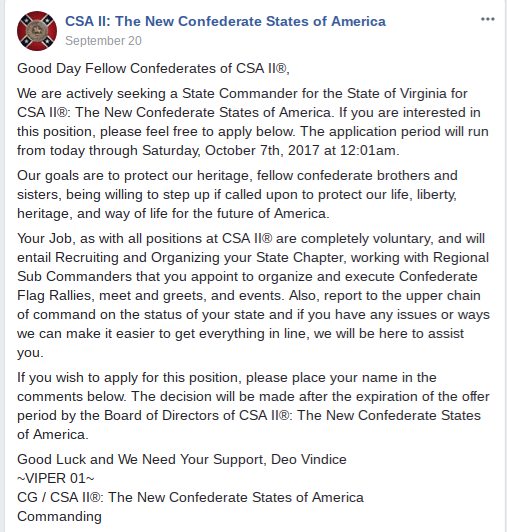 The neo-Confederate group CSA II: The New Confederate States of America is trying to increase their presence in Virginia in anticipation of their planned rally on December 9, by appointing a “State Commander”. Only seven have confirmed their attendance as of today, with many expressing worries about counter-protestors, despite the complete lack of violence at the last rally, which cost the city nearly $600,000 in preparation costs. The CSA II, led the failed rally in Richmond this past September when the out-of-state group planned a show of force to ‘protect’ Lee Statue. Only seven people showed up to support the CSA II, and their actions in Richmond were met with wide condemnation from city officials and residents. This ad, posted on September 20th via Facebook, closed on October 7 without producing a single candidate, a likely indication that their upcoming rally will also generate negligible local support. No one at CSA II was able to speak to the posting at press time. More than 7,000 people filled the Richmond Convention Center last night to see former President Barack Obama and Lt. Gov. Ralph Northam at a rally for Northam’s gubernatorial campaign. It is one of two offseason races and viewed as a referendum on President Trump’s national agenda. 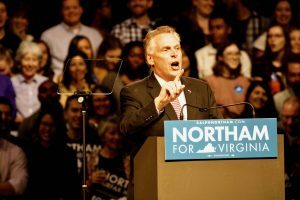 It’s also a high-stakes election for the Commonwealth, before the 2021 redistricting, which would be facilitated by a majority Republican legislature should Northam’s GOP opponent Ed Gillespie win the race. Gillespie, a longtime lobbyist and GOP insider who has never held office, but masterminded the Redistricting Majority Plan (REDMAP), a $30-million campaign that was dissected in Ratf**ked: The True Story Behind the Secret Plan to Steal America’s Democracy. The new book by Salon Editor-in-Chief David Daley, theorizes that Gillespie was part of a successful effort to resist President Obama’s legislative agenda, building a GOP firewall in the House and laying the groundwork for control of the Senate and the presidency of Donald Trump. Strategically, it makes it even more significant that Obama’s visit to Richmond marks the return of the former President to politics. The rally followed a familiar formula, right down to a soundtrack that included Tom Petty and music one attendee described as “perfect for square dancing.” Local politicians and party officials took turns speaking to the crowd with varying degrees of enthusiasm before statewide candidates rallied the audience with their stump speeches. 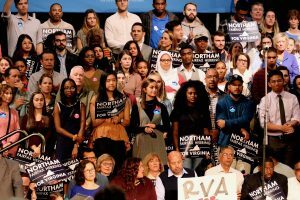 The intensity of the crowd waxed and waned along with the speakers, culminating in the loudest, most raucous cheers when Northam, the keynote speaker, introduced former President Obama. Obama ran up the stairs with the characteristic grin and verve that Americans became used to over his eight-year presidency and quickly launched into a positive, high-minded speech that remixed his Yes We Can campaign message with the cautionary tone he’s adopted since President Trump’s victory. 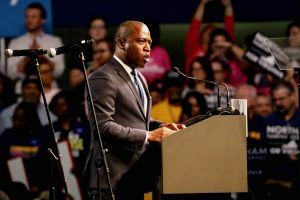 He repeated his new slogan “Don’t boo, vote,” speaking to the big concern among Democrats that voter apathy and disillusionment is keeping people from participating in elections. Although redistricting represents one of the most pressing topics for the Democratic Party, President Obama saved this issue until near the end of his 45-minute speech. “We shouldn’t have politicians deciding our voters, we should have voters deciding our politicians,” he said, invoking a populist tone. 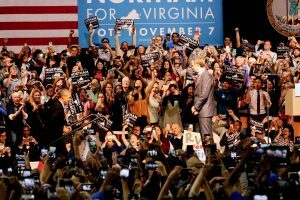 President Obama was preceded by a who’s who of Virginia politics, including Congressmen Donald McEachin and Bobby Scott, Lt. Gov. candidate Justin Fairfax, incumbent Attorney General Mark Herring, outgoing Gov. Terry McAuliffe, and Richmond Mayor Levar Stoney. 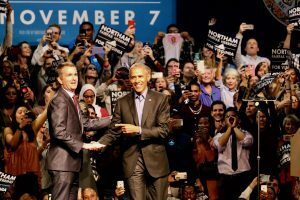 Northam was the final speaker before President Obama, and sat to his side as the former President spoke to the crowd. 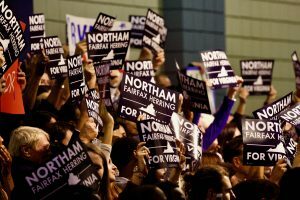 The polls have narrowed from a comfortable lead for Northam to a single-point victory for Gillespie, but Gov. McAuliffe, speaking earlier in the night, was optimistic. “Four years ago, just about this time, Obama campaigned for me when I was running for governor. You worked your heart and soul out to get us elected and I want to say thank you. 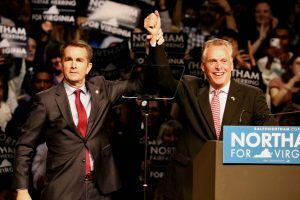 We broke a forty-year trend to win the governor’s office and we’re going to do it again with Ralph Northam,” he said, predicting a McAuliffe win. Bowers was familiar with Gillespie’s role in REDMAP and was generally critical of the district system in Virginia. “It’s not representative. It’s a horrible system,” she said, expressing a sentiment that President Obama would later share. Others were a little more restrained. 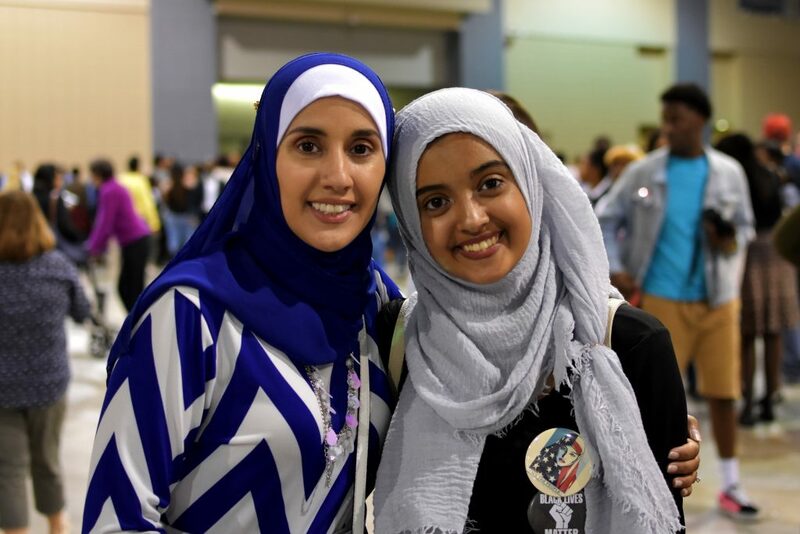 “Of course I was excited,” another woman said, shrugging before she left the convention hall. The statewide elections will be held Nov. 7. Prospective voters can check their registration or lookup their polling place on the Virginia Department of Elections site. News of Republican presidential frontrunner Donald Trump’s rally served as an interesting addition to midterm week at VCU.